Next time your child’s in a roomful of toddlers, take an objective look around. Chances are you’ll notice that she’s not the only shy one in the bunch – and in fact, that many of her peers are as tentative as she is. That’s because two- and three-year-old are rarely outgoing; most show signs of shyness at least part of the time. Some are comfortable enough with adults, but not with peers. Others are comfortable with a small group of peers, but won’t speak to an adult outside the immediate family. Still others are shy with anyone they don’t know well. By age six, about half of all children are still shy, though half of these will shed their shyness in the teen years. But in about one in five children the shyness is inborn rather than developmental; these children never completely shake shyness, though they often learn to overcome it. Accepting her shyness. This can be especially hard to do if you are naturally gregarious, but especially important, too. Your child is a separate person – a two and a-half-year-old person at that – and she shouldn’t be expected to behave the way you do. 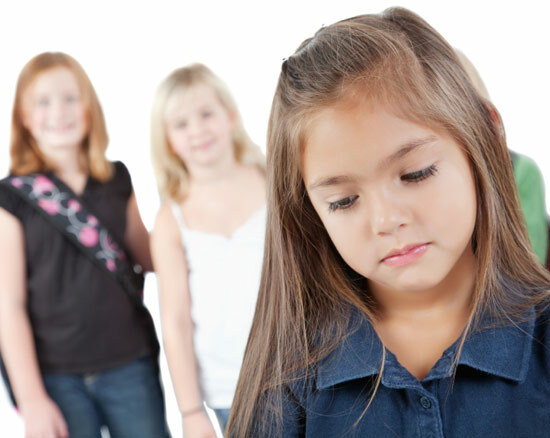 Viewing her shyness as a shortcoming, and expressing even subtle dissatisfaction with her lack of social prowess, or hinting that her behaviour embarrasses you, can cause your toddler to withdraw further. Instead, let her know that you love her the way she is. Don’t label her. Calling your toddler ‘shy’ – when talking to her or when talking to others when she is near – will make the label stick in her mind and teach her to accept it as a fact. The label could thus perpetuate her shyness, even if it isn’t inborn. Later, it may lead her to use the label as a way of avoiding unpleasant or uncomfortable situations: ‘I’m shy, so I don’t have to.’ Avoid pointing out or praising more gregarious children, too, and drawing comparison between their social performance and hers. Not only do you risk hurting feelings, but her lack of self-esteem can exacerbate shyness. Understanding her. Even if you’re not shy, ‘working the room’ (especially when it’s a room field with already paired-off or teamed up toddlers) is tough. Don’t scoff at her very real anxieties and concerns; give her all the reassurance and support she needs. If she’s anxious in certain types of situations, don’t force her into them. But don’t be too quick to come to her rescue either. Give her a chance to succeed before you decide she’s going to fail. Encouraging her. While you shouldn’t push your toddler into social interactions, you should encourage her to participate in activities with other children, and help to break the ice, when necessary. Initially, she may find it easier to socialize with children who are a bit younger than she is (she will feel less threatened and, as the ‘big girl’, may feel more confident), or a year or two older (if she feels comfortable in the role of follower. No matter their ages, the playmates you select should be laidback, rather than aggressive. You can also assist her by fostering friendships, building her confidence and self-esteem, helping her feel good about herself, and by teaching her what to do when she’s anxious in a situation (think of something pleasant, or take a couple of deep breaths, for example). Rehearsing her. In the guise of a no-pressure game, encourage relevant role-playing. Sample scenario: a teddy or a doll is hanging around on the edge of the playground, wanting to come and play with the others, but is afraid to try. Ask your toddler for advice, and she give the outsider some good suggestions for joining in, material your toddler can put to use in similar situations later on; children are great imitators. Remember to always conclude your script with a happy ending (teddy joins the group and has a great time). Preparing her. Some children are particularly sensitive to transitions; preparing them well for new situations or giving them a head start can help them to cope better. En route to social events – including school – with your toddler, spend a couple of minutes preparing her, so she’ll know exactly what shes getting into. Go over the names of the children or adults who will be there, the activities that might take place, how she will greet everyone on her arrival. But take note of your toddler’s reaction. Overpreparation can increase anxiety rather than decreasing it. Equipping her. As ever adult partygoer knows, entering a social situation is always easier if you’ve got something in your hands – a bag, a cold drink, a plate of canapés. Likewise, your toddler may feel more confident striding something – a doll or stuffed animal, for instance. Not only will the toy, because its hers, give her a sense of security, but it may give her an ‘in’ with the other children – whether its used in the game or just admired. Prepare your child for the possibility, however, that she may need to share the toy she brings and help her select a toy she is willing to share. Helping her, if she needs it. If you see your toddler looking longingly over at a group of children at play, and she seems to want to join but doesn’t know how, try giving her a few social pointers. Without pushing her to advance before she’s ready, suggests a way in (‘Why dont you go over and show those girls your new doll?’). Or if she’d like company when she makes her move, volunteer to move in with her – at least for a while. With her okay, take her hand and enter the circle of play together, asking permission of the other children before you join in (‘Could Jessica and I help you make that sand castle?’). Stay as long as she needs you, but no longer; retreat as soon as she seems comfortable.